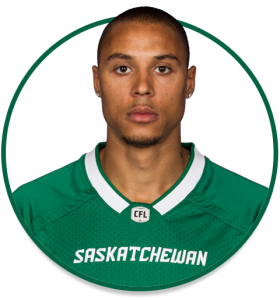 PRO: Signed with the Riders in May, 2018…signed with the Riders in January, 2016…signed with the Winnipeg Blue Bombers in April, 2015. 2018: Played 17 regular-season games and the Western Semi-Final…registered 12 special teams tackles…added one special-teams tackle in the playoffs. COLLEGE: Played five seasons with the Brandon University Bobcats men’s basketball team.